With this product, you earn 89 loyalty points. 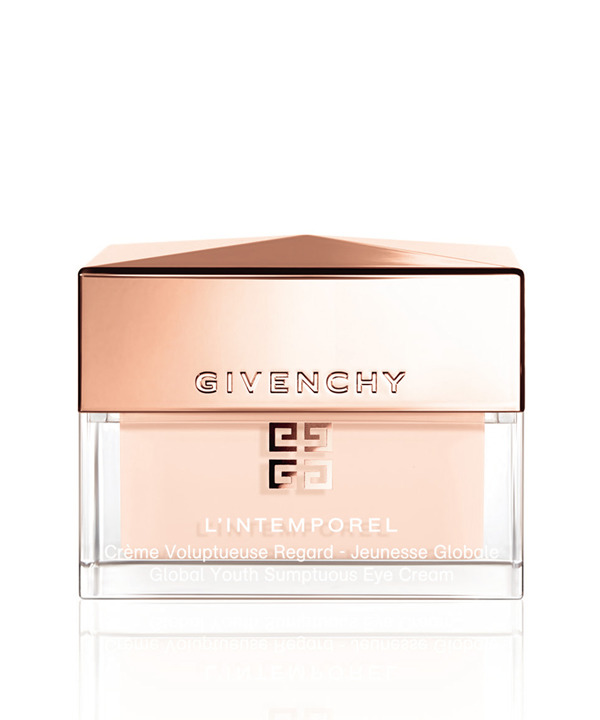 Global Youth Sumptuous Eye Cream is a fresh and creamy delight of rosy elegance. It tautens the skin and wraps the eyes in a luscious cocoon of moisture to beautifully enhance the delicate and fragile area surrounding the eyes. The eye contour is immediately smoothed and revived, glowing with new radiance. Day after day, the skin tightens and firms. The appearance of wrinkles and fine lines is visibly enhanced while dark circles seem to be reduced. The eyes look brighter, more luminous and more open. Visibly younger. Apply in the morning and/or evening by lightly patting with the fingertips from the inner corner to the outer corner of the eye followed by a gentle, stimulating massage. 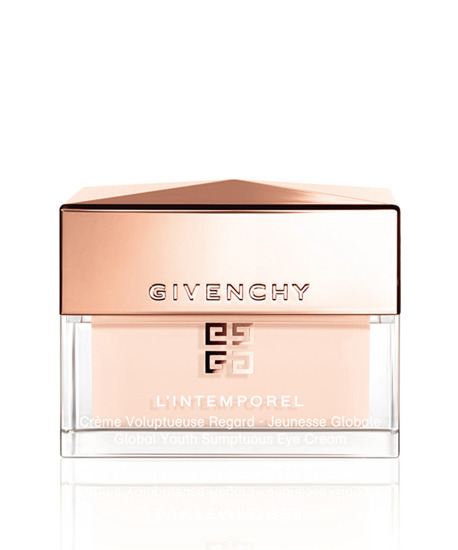 Givenchy laboratories have created the Timeless Blend Complex, an innovative combination of a heat-sensitive molecule (IR Sensitive), that uses infrared rays to protect the skin against accelerated skin aging, reinforced with a selection of essential age-defying ingredients for a timeless youth effect (Vitamin E derivative, encapsulated polyphenols & low molecular weight hyaluronic acid) . • IR-SENSITIVE : powered by the heat of IR rays, this ingredient reinforces the skin’s protection against oxidation and stimulates collagen fibers to contribute to recreate a denser support mattress for firmer skin*. • VITAMIN E derivative: this hydrosoluble derivative, guarantees a constant and reinforced antioxidant action to optimize skin revitalization*. • Encapsulated POLYPHENOLS: encapsulation allows these powerful free radical scavengers* to remain intact until they are released onto the skin for optimum effectiveness. • Low molecular weight HYALURONIC ACID: the ultimate plumping ingredient contributes to deeply reinforcing the firmness of the skin. Revitalized and effectively preserved, your skin glows with timeless youth. *In vitro test ingredients IMMEDIATE AND LONG-LASTING MOISTURIZING*: +20% after 24h ILLUMINATING ACTION**: Soften dark circle aspect -29% Skin radiance +10% Eye contour skin luminosity +9% Fine lines under the eye look reduced for 92%** of women after 2 months of application. * Instrumental test on 11 volunteers *Clinical assessment by dermatologist on 37 women after 8 weeks of application.